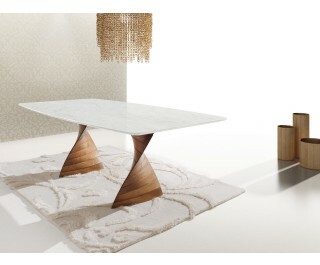 Table with a great visual impact and a top in transparent glass that rests upon two bases with sinuous and elegant forms in stained or open pore varnished ash. Thirty years young. After thirty years, we still have the same energy and enthusiasm in designing and developing our products, and we are still meeting the twin challenges of innovation and technology in our quest to guarantee the maximum possible customer satisfaction. Our success has been made possible entirely by a deep-rooted company philosophy and by the talent and experience of our highly-qualified staff; today, as well as an in-house R&D department, Idealsedia can also draw on the talents of a team of world-renowned designer. Idealsedia was founded in 1979 by the Cozzi family as an outside supplier to the chair manufacturing industry. After an initial period of small-scale production in a tiny workshop, the three Cozzi brothers – Luigi, Gianfranco and Agostino – drawing on their foresight and strong determination, decided to purchase the first warehouses and production plant in Premariacco, in the province of Udine. Idealsedia has always focused on renewing its products and on producing items that anticipate the requirements of the market. Our close attention not only to the type of product but also to the woods and materials used in their construction is clear to see; every phase of production, from the initial design to the completion of the finished product, is carried out in our workshops using only materials made in Italy. Today’s company is modern and well-structured, and is one of Italy’s leading manufacturers of household furniture. Tables and chairs still represent the greater part of Idealsedia’s sales, but other articles, such as accessories, furniture elements and complementary items are steadily being added to our product range. Idealsedia’s current product range is almost equally divided between articles in metal and wood, though always with an eye to the trends in the market and without neglecting the use of other materials such as the various types of plastic, flat and contoured glass, as well as the latest hi-tech materials. Today, Idealsedia’s products are sold in Italy and throughout the world, with exports accounting for 75% of sales.